This is both an educational and entertaining experience for adult and child alike. Packed with facts but providing hands on activities for the young of any age. A short drive to Kleinbaai, and you can board a boat trip to visit the marine big five: shark, whale, dophin, penguin and seal. Its a huge educational experience. Walking with Willie is much more than just a look to see. Local resident takes you on a walk about to meet the people. Visit a variety of community projects operating, varies due to the time and day. Enjoy an adventure in the scenic Hemel en Aarde Valley. Times scheduled by arrangement. 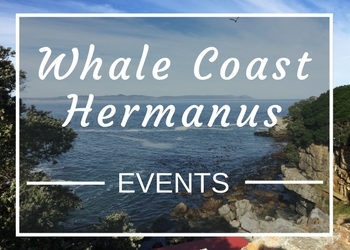 Hermanus is famous as the best land-based whale watching location on the planet. From mountain top to seaside, whales can be spotted breaching, spyhopping, lobtailing and other activities less visible. Coastal & mountain walks give you stunning views of the giants of the sea. Wine Tours take you through Walker Bay’s Hemel en Aarde Valley to 5 wine estates tasting their collection of vintages. Optional lunch with a magnificent panoramic view of the valley or while watching whales (in season) from the harbour.